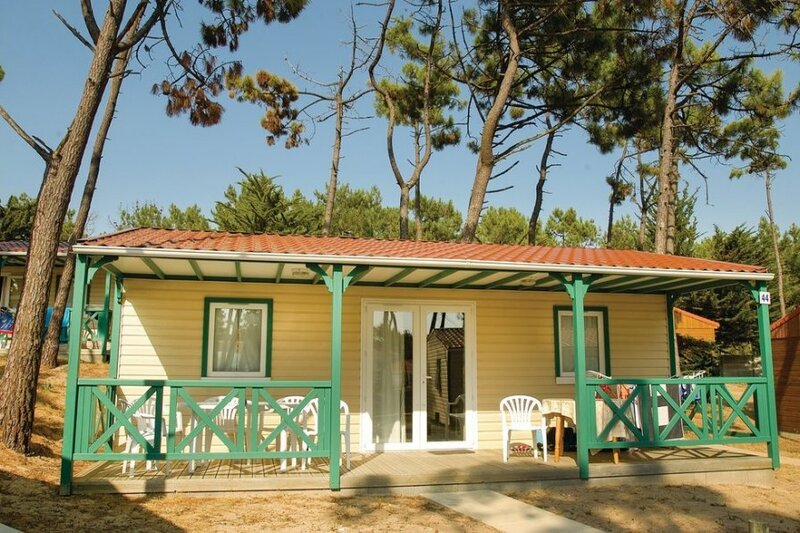 This family run four star holiday park lies just 900 metres from the lovely sandy beaches of St Hilaire de Riez. This family run four star holiday park lies just 900 metres from the lovely sandy beaches of St Hilaire de Riez. We can offer a choice of 1 bedroom (FVE122) or 2 bedroom (FVE121) houses and 2 bedroom (FVE157) or 3 bedroom (FVE158) chalets. All are furnished in the simple but comfortable style typical of the area and enable you to take advantage of the glorious location in this famous resort. On site you have a choice of an indoor heated pool and jacuzzi or the larger outdoor pool. There is also a tennis court, a covered table tennis area, a gym with sauna, basketball and a children's club in season. There is a small shop and bar on site, and a larger choice of shops, bars and restaurants are a short walk away. The area has a superb network of cycle paths too, and with the Vendée being fairly flat, the cycling can be as relaxed as you wish ! There are several other resorts locally too, shopping centres, bars and cafés and beach side promenades. Try to visit the island of Noirmoutier 10kms to the North, there are several golf courses the nearest being at St Jean de Monts, horse riding and of course all the watersports you could want. A great place for a holiday for family or couples. Tennis : 5EUR / hour, Fitness: 5EUR / hour, Sauna : 5EUR / 30 minutes, Baby-sitter : 5EUR / hour, Kit for baby (cot and high chair) : 15EUR / week, TV : 30EUR / week, electric barbecue : 7EUR / week, washing machine : 4EUR / chip, dryer : 3EUR /chip, detergent : 0.50EUR / dose, bakery : bread/croissants every morning, on request made the day before. This modern villa is made from wood and was originally built in 2008 and refurbished in 2015. The agent has rated it as a three star property so it is a well-kept villa, equipped with standard furniture. It is also good value for money. This villa has use of a shared pool and is located in Saint-Hilaire-de-Riez, only 6km from St Jean De Monts. It is set in a very convenient location, just 900 metres away from a sandy beach. There's also a restaurant only 900 metres away. The villa has free wireless internet. You can also park on-site at no extra charge. The villa is adequately equipped: it has a refrigerator and microwave. It also has some garden furniture outside.